I’m a total geek when it comes to slick kitchen tips and tricks. This weekend, I learned two great tricks in the same conversation, and I put them both together to make these super-easy, roasted garlic potatoes. 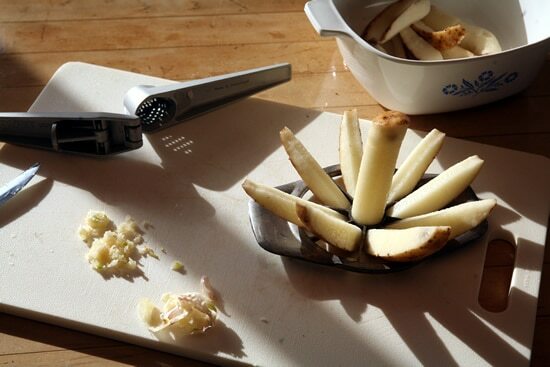 This is so simple, I can hardly believe it: Use an apple corer to make potato wedges. In one fell swoop you get a handful of wedges (along with a somewhat amusing cylinder of potato core, which tastes just as good). Turns out, you don’t have to peel garlic before pressing it! I had no idea. You do need to peel off the dry outer skin of the garlic head, but you don’t need to fully peel the clove. The skin will stay behind in the press, and you can then toss it in your vegetable scrap bag. This morning, while taking pictures for this post, I realized I had a bunch of garlic and potatoes leftover. What to do? Make Roasted Garlic Potatoes for lunch, of course! Serves 2-4, depending on the size of the potatoes. Preheat over to 350°F. 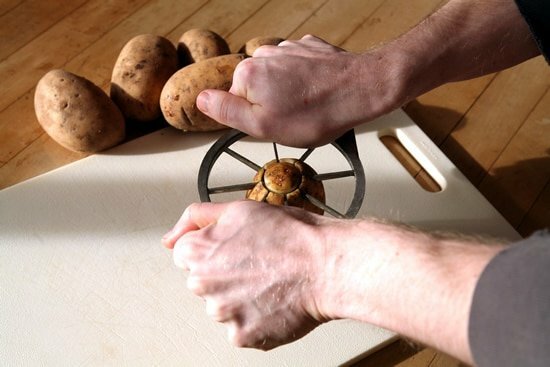 Using an apple corer, slice the potatoes into wedges. Place them in a small casserole dish. Using a garlic press, crush the (unpeeled!) cloves of garlic. Add the garlic to the potatoes. Drizzle olive oil over everything, then lightly season with salt and pepper. Mix everything together to evenly coat the potatoes. Bake, uncovered, at 350°F for 60 minutes, stirring every 20 minutes to ensure even cooking. Finish by broiling for a few minutes to get them nice and crispy. Thanks to Dennis and Matty for the tips! That potato trick is awesome. I can’t believe I haven’t thought of that. Right? I felt the exact same way… Love it! Add me to the list of befuddled people who can’t believe I didn’t think of that potato trick before! Brilliant! Thank you for sharing. 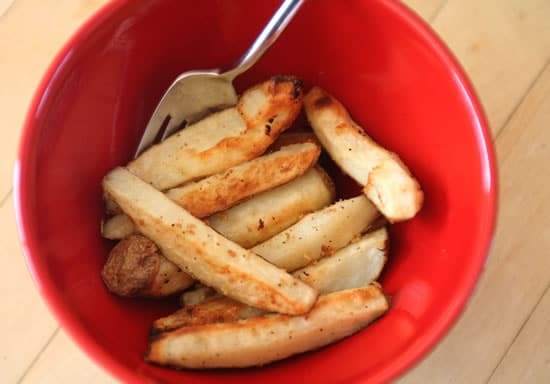 We had russet potatos in our CSA box today, so I now must make potato wedges tomorrow!